Aunt Bertha always insisted on giving us children a gift on our annual visit – in spite of the fact that she was on a fixed income and funds were tight. In the early years, it would be a knick-knack off a table or a hanky from her drawer. As time went on and her possessions dwindled, she would scrounge through cupboards to award us a teacup, juice glass, or cereal bowl. Protests that gifts weren’t necessary were lovingly waived away. Some years back, my parents and I visited her at her flat one last time before she moved to assisted living. Aunt Bertha, with dimmed eyesight, found just the perfect gift for me. 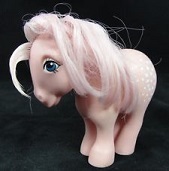 A dirty, used “My Little Pony” she had won at Bingo. I was well into my thirties. Back in the van, my parents and I chuckled over the gift, knowing it had been generously given. With the same spirit of generosity, I offered it to my mother. She declined. There was no way I could just throw away something Aunt Bertha had given me in love. So at the end of the trip, I tucked it under the seat of my parent’s van, left them wintering in Florida, and headed back to Oklahoma. A week later, I received the scraggly pony in the mail. And so it began. For the next fifteen years the pony suffered further abuse as it was stuffed into a coffee pot, boxes, drawers and other various hiding places during our visits to each other. Messages were written and scribbled out on it. Friends and family were called in as accomplices to assist us in our devious deliveries. 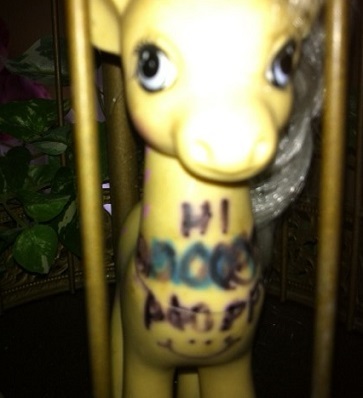 On one visit, my parents hid the pony in our house. When they arrived home in Maine two weeks later, it greeted them on their kitchen table. When they moved to Florida, the pony stood chilling in their refrigerator upon a return from an Oklahoma visit. 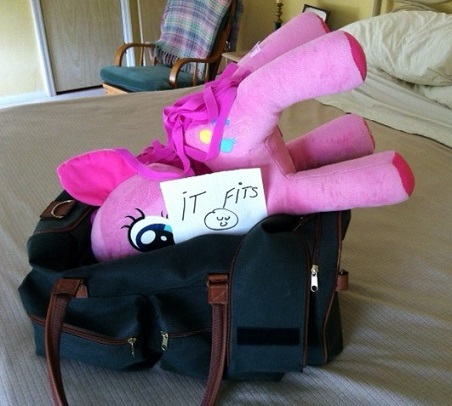 Last year, right before leaving their home, I made sure the pony was tucked in tight in its newest hiding place. When I opened my carry-on bag at the airport to grab my book, that damn pony was nestled amongst my undies. I should have known better than to hit the bathroom right before leaving! 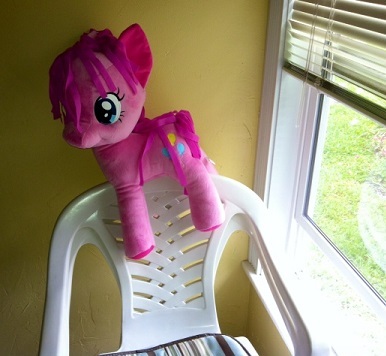 A few weeks later, when my husband and I saw the jumbo hot pink stuffed “My Little Pony” in a store, we knew where it’s new home was going to be. We got a call from Florida a few days later. “What the hell are we suppose to do with that?” My mother’s New England accent was evident – the ‘are’ sounded like ‘aa.’ After a good laugh, we told them to donate it somewhere. And yet there it was when we arrived in Florida last month – sitting in a chair waiting to annoy me with its pinkness. *Originally published at Oklahoma Women’s Bloggers and entitled The Saga of the Traveling Pony. Like the new and improved title my sister came up with? ?